Horsetail (Equisetum hyemale) is a perennial plant with hollow stems and no leaves. Growing in the wild, in or along the banks of streams and rivers, it grows to 4 feet in height. Horsetail spreads by rhizomes and will, if not controlled, take over the area in which it is planted. The horsetail plant is low maintenance, with no special soil requirements. The horsetail plant is hardy to USDA zones 4 to 11. Grow your horsetail plant in an area where it will receive sun in the morning and afternoon shade. 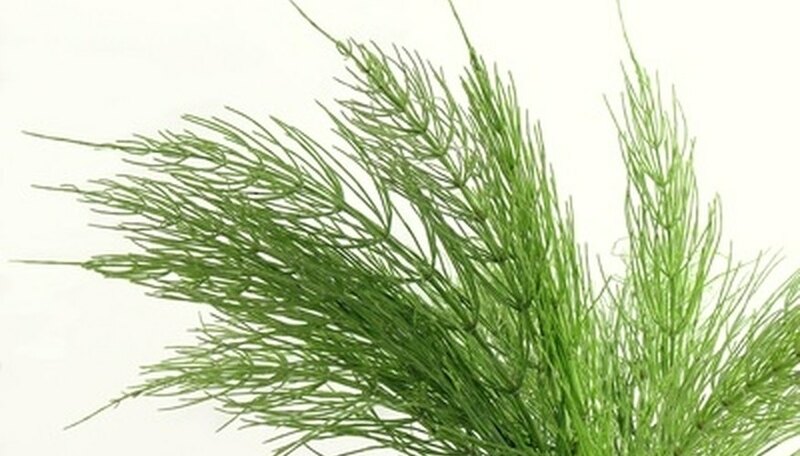 Water the horsetail plant frequently. Although it can tolerate a bit of drought, in the wild it sometimes grows directly in water. Saturating the soil frequently will help the plant to thrive. Prune the horsetail if the stalks become damaged by cutting them off at ground level. If you cut mid-branch or higher the plant has a tendency to branch into multiple stems, making it top-heavy. The common variety of horsetail reed is a popular ornamental grass for water gardens and moist areas of lawns. Commonly known as "bottle rush," it is of the scouring rush variety. People have used it for centuries to clean pots, pans and silver. This horsetail reed is markedly different, as it bears leafless stems and does not recede during fall. Easily identified throughout the Pacific Northwest by its deep-green color and double black bands at its jointed stems, the Equisetum hyemale can reach a height of 4 feet and adds a uniquely tropical look to any landscape. Equisetum scirpoides, more commonly known as Dwarf Horsetail, is a reed known for its erosion control and deer-resistance properties. Essentially a mass of reeds that grow in a dense mat of slender, jointed stems, this variety makes an excellent grass-like ground cover for wet spots in your yard. It will only grow to about 8 inches in height. The Giant Horsetail is the tallest and most robust variety of this group of plants. Found west of the Cascade Mountains, Giant Horsetail reed plants originated in Europe and northern Africa and can now be found along North America from Alaska to northern Mexico. Remove the tops of the horsetail plant, within two weeks of the green plant's emergence from the soil, by cutting them off at ground level with the shovel. The lack of the green shoots will restrict food intake to the rhizome root structure. Practice the green shoot removal for period of three to four years for effective cultural control. Layer the area with a plastic sheet as mulch to heat and suffocate the weed. Cover the plastic mulch sheet with a wood bark material to hold it in place. Apply the herbicide dichlobenil to the horsetail plant. According to Washington State University, the most effective time of year for this herbicidal application is in mid-winter. Many herbicides have proven ineffective to the horsetail plant. Consult your local agricultural extension service for other herbicide control in your area and climate. Follow all label direction in the application of the herbicide. Repeated chemical treatments will be necessary to eradicate this noxious plant. Choose a planting spot near or in up to 6 inches of water, which is in full sun. If your pond does not have an area with full sun (more than six hours of sun every day), the horsetail will grow in partial shade. Dig a planting hole as deep as the root ball on the horsetail plant, and twice as wide. Center the plant in the planting hole and backfill with soil. If you are planting in the water, move the silt with your hands while gently pushing the root down into the silt. Push the silt over the root ball. Water well if the soil is somewhat dry. The horsetail prefers living in water, so if you chose a spot that is not in water, water the horsetail at least every other day with at least 1 inch of water.